In my previous visual task board I found prioritization meaningless. Tasks are either important or not. If it is important then put it on the list. If not then don't waste time or space pretending that you'll get to it, because you won't. Dan Markovitz from TimeBack Management and I had several discussions on the set-up of a personal kanban. We discussed how to determine the size of WIP. The WIP limit shouldn't be determined by the number of items, because one large task/project consumes as much time (which is your critical resource) as eight small tasks. Unlike a production line where the cycle time is both known and constant, knowledge work is inherently more variable. So it's tough to determine the appropriate WIP level. We also talked about using the calendar as kanban. By designating dates and times for specific tasks and projects, you've essentially created a production schedule for your work, with the calendar (and the calendar alerts) acting as a kanban that pulls work forward. 1) Establish Your Value Stream – The flow of work I chose was Backlog, This Week, Today, and Done. 2) Establish Your Backlog – I put every task onto a post-it-note, if the task had a due date I put that on the note as well. 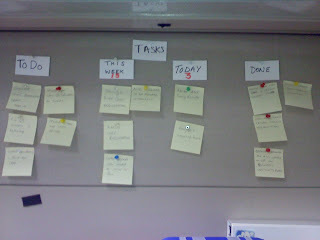 4) Begin to Pull – I moved tasks into the next two columns and got to work. 1) For really small tasks I still keep a todo list with paper and pen. 2) This Week column allows me to plan out my week. 3) A WIP of 3 has been working for me for tasks around 1-2 hours in length. 4) The size of the task is not too important. Smaller tasks make you pull faster. For larger tasks I try to break them up into workable chunks. 5) The current board is not portable which I need. 6) Adding color to this system would help distinguish different types of tasks. While looking at various ways to improve my kanban system I came across this presentation on kanban designs the inspire flow. In the next version of my kanban I will attempt to address some of the previous short comings. Just as in Kaizen in your organization, having tried a quick and easy manual version of this kanban I found what works and what doesn't. Now making those improvements will be even easier. Interesting idea, Tim. I might have to experiment with sequenced pull balls to manage my tasks--terms for my online Lean encyclopedia, new products, blog posts, podcasts, etc. I use AgileZen.com to do this electronically, since my gemba is at so many different places. I've also been on a Personal Kanban "diet" for a few months now. I must say it has changed a LOT of things on my perspective of work. 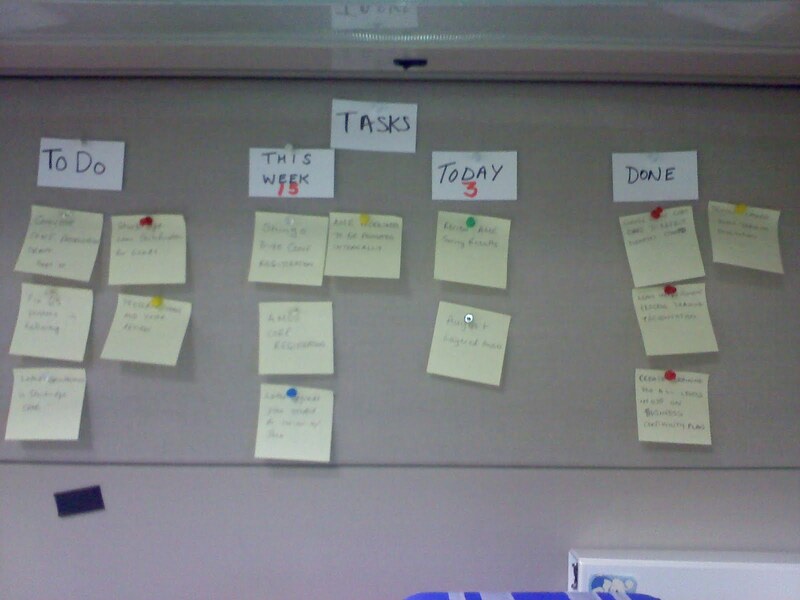 But since I had other knowledge about time and life management, I created a slightly different way to handle my kanban. Would you care to review it and tell me what you think as a user of a personal Kanban? I created a video that explains it. I think the characteristics you mention (visible and limit WIP) are essential elements that make this work. I think a third that I find important however is remaining flexible. We like to think that if we plan what we'll do at 2 pm on Tuesday, that this is how it will happen. However, stuff gets in the way. This means that time-based project planning, whether for a project or for yourself, has its limits. Instead, think of this as work-flow planning. I may not know exactly when I'll do it, but I know what I will do it after. Another beautiful article by you tim, this feel much pleasure when I read your article about Kaizen Training , I'd really like to appreciate you about this keep sharing dear.